The route is located on the Camp 4 Wall. At the western end of Camp 4 is a dry streambed. Walk up this until just before it first intersects the wall, bear slightly left out of the streambed and the route will be about 50 yards away. The adjacent route, Doggie Diversions, is about 10 feet to the right of Doggie Do and appears as an obvious squeeze chimney. The approach takes about 5 minutes from Camp and is very easy to find. Pro: #3 to #4.5 Camalot with an optional hand sized piece. I took and used doubles in the #4.5 size. The hand section is right after the crux and just before the top, very hard to fall out of it (thus the "optional" hand sized piece). A large tree is on top for an anchor. Walk off climber's left. The business on this route is a very short section exiting a pod at about 2/3 height. The section leading to this is quite easy, low angle, maybe 5.7-. At the crux reach deep and there is a good positive sidepull edge way back in the crack. Bring your right knee as high as possible and ram it in there, above the lip of the pod. Sit up on it and shuffle up the knee a couple of times from an armbar or stack. The crack suddenly goes to perfect hands and you have a body length of easy crack to the top. 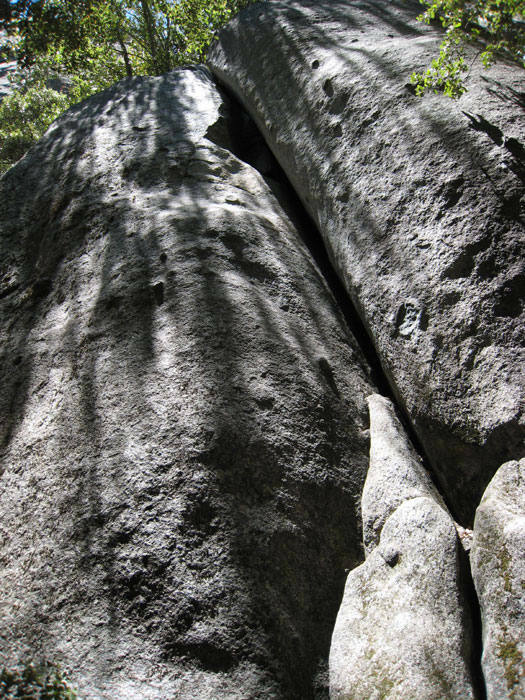 This is one of the easier OWs at the grade in Yosemite. Although this side of the valley gets sun, the route is shady during summer.